From the moment of foundation in 1946 those research areas and scientific schools shaped up and gained momentum at GosNIIAS, which at present form the core of its scientific and technical potential. The Institute has always paid great attention to highly-qualified personnel training for aviation industry. On the premises of GosNIIAS there are six sub-faculties of leading Russian Institutes - MIPT, MAI, MIREA and the postgraduate courses. Of approximately 800 specialists who completed postgraduate courses more than 370 defended Candidate dissertations. The Institute pursues recent graduate support program. At present GosNIIAS staff includes two members of the Russian Academy of Sciences, one corresponding member of the Russian Academy of Sciences, more than ten members of various science academies, 26 Doctors of Sciences, 232 Candidates of Sciences. During its 70-year history the Institute has developed very close scientific and production relations with the Academy of Sciences of the USSR, and nowadays with the Russian Academy of Sciences. Evgeny A. Fedosov, GosNIIAS Research Adviser, First Deputy General Director, member of the Russian Academy of Sciences is the assistant academician-secretary of the Division of Energy, Engineering, Mechanics and Control Processes of the Russian Academy of Sciences and the chairman of the Section of problems of engineering and control processes, the chairman of the Joint scientific Council on “Control processes and automation” systemic problem of the Russian Academy of Sciences, head of “Data processing and control systems of modern and advanced aircraft” scientific school, which is supported by the Russian Foundation for Basic Research. In October, 2016 S. Zheltov, FGUP GosNIIAS Director General was elected a member of the Russian Academy of Sciences. The Institute has a printing and publication center which publishes information and analytical materials and papers, dedicated to the analysis of aeronautical science and technology development. In conjunction with the Russian Academy of Sciences FGUP GosNIIAS is a co-founder of the ”Proceedings of the Russian Academy of Sciences. Theory and Control Systems” magazine. GosNIIAS has won world-wide recognition and multiple government awards. 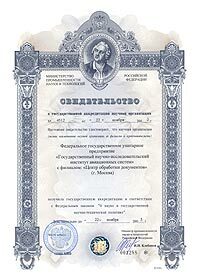 In accordance with the resolution of the Presidium of the Supreme Soviet of the USSR of August, 23, 1977 the Institute was awarded the Order of the Red Banner of Labour. In accordance with the resolution of the government of the Russian Federation № 247 of 29.03.94 the Institute was awarded the status of the State Scientific Centre. In 2001 the French Chamber of Commerce awarded the Large Gold Medal to GosNIIAS. In 2003 the SCS FGUP GosNIIAS became the winner of the Russian National Olympus prize. The Quality System complying with ISO 9001-94 (Russian analogue GOST R ISO 9001-96) international standard has been created and at present is being introduced at GosNIIAS. Around 100 Institute specialists completed training in Russian training centers and have certificates of quality managers and experts-auditors. In 2000 GosNIIAS Quality System was audited by an independent certification agency – Certification Union - that awarded to the Institute the Certificate (№ 6300.311451/ZL of 19.10.2000) on compliance with international quality standards. At present the program of transition to ISO standards, Version 2000 is carried out. GosNIIAS actively pursues international cooperation through joint projects with foreign companies and organizations: ROCKWELL Collins, Hughes, Intermec, Digital, Evans & Sutherland, Smiths Industries, THALES (THOMSON-CSF, Sextant Avionique), CATIC, the Indian Air Force and others. An example of international cooperation is the joint effort of MiG-AT trainer avionics system development in conjunction with Sextant Avionique and Mikoyan design bureau. IL 96 M/T software was developed by GosNIIAS specialists in cooperation with ROCKWELL Collins. IL 96M/T avionics hardware and software were certified in line with FAA (USA) and AR IAC (Aviation Register of Interstate Aviation Committee) (Russia) international requirements. Kazan ATC (Air Traffic Control) Center integration and engineering support efforts were conducted in cooperation with THALES AIRSYS.